The National Student Clearinghouse Research Center released today a snapshot report titled, “Yearly Success and Progress Rates – 2019.” The snapshot report shows college outcomes for second year through sixth year success trends for full-time and part-time freshman. 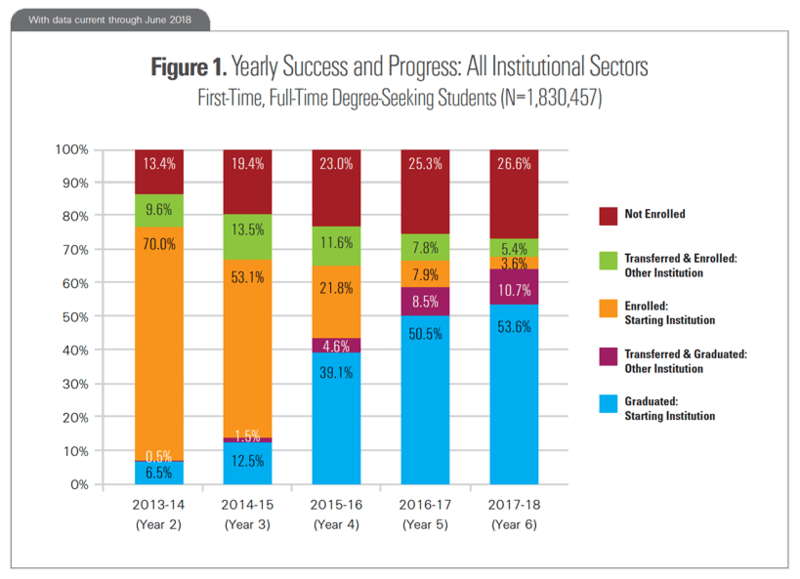 The report goes beyond traditional measures of postsecondary attainment by tracking the fall 2012 entering cohort at the end of each subsequent academic year, showing transfer, persistence, stop-out, and completion rates. Also included is state-by-state visual data and a complete set of downloadable data tables. For full-time students at two-year and four-year institutions combined, we observe 64.3 percent graduated by year six, while 26.6 percent left college without earning a credential, and 9 percent were still enrolled. By year six, 33 percent of part-time students graduated, while 51.6 percent left college without earning a credential, and 15.4 percent were still enrolled. For part-time students, in year three, almost 40 percent had stopped out, an 11 percentage-point increase compared to year two. By year six, over half, 52 percent, stopped out without a credential. Full-time students in four-year, private, non-profits have the highest graduation rates, 79 percent by year six, and lowest stop-out rates, 15 percent by year six, followed by full-time students in four-year public institutions: 70 percent graduated and 21 percent stopped out by year six. Looking at year three, part-time students have higher graduation rates compared to full-time students. In four-year public institutions, part-time graduation rates by year three is 11.4 percent compared to 9.2 percent for full-time students. This difference is greater at four-year private non-profit institutions, full-time: 11.3 percent vs part-time: 20.3 percent. For full-time students, in their third year, 17 percent had transferred to another institution, almost double the transferred population in year two, 8.8 percent. For part-time students, the number of students who stopped out increased from 20.5 percent in their second year to 37.8 percent in the third year. By end of year six, over half, 53 percent, had stopped out without a credential, including 8.6 percent who stopped out after transferring to another institution. The outcome categories are modeled after those used in the Student Achievement Measure (SAM), and can be used by participating institutions for benchmarking against state and national averages. Unlike SAM, this snapshot report includes postsecondary certificates in graduation counts for four-year institutions in addition to two-year institutions. The inclusion of certificates increases six-year graduation counts by 1.6 percent at four-year publics, 0.6 percent at four-year private nonprofits, and 4.9 percent at four-year for-profits. To learn more details about the four-year and part-time success and progress rates, review the snapshot report, Yearly Success and Progress Rates. This fourth annual release of the Research Center’s Yearly Success and Progress Rates provides institutions with national-level and state-level SAM reports — vital benchmarks for tracking their students’ success.